If you are looking for a villa to rent in the riviera of Dubrovnik you will find it on this page. and its Riviera from our selection of accommodation. Croatia mapThe capital of Croatia is Zagreb, a charming medieval city of exceptional beauty known for its spirit and architecture, with a population of approximately 1 million. The city with a tradition of almost one thousand years celebrated in 1994 its 900th birthday. Over the years, Zagreb has become the scientific, political and economic center of Croatia. The uniqueness of Croatia lies in its diversity. Situated between the Alps and the Adriatic Sea, Croatia provides visitors with the opportunity to ski in the winter and swim during the summer months, all within driving distance. With its 1.185 islands, islets and reefs, it is the most diverse coast on the Mediterranean. Whether traveling by land or sea along Croatia’s shoreline, you are guaranteed a voyage of spectacular scenery and breathtaking views. The bare mountains running like a spine down the coast, the translucent Adriatic and the picturesque towns are surrounded by more than a thousand islands anchored offshore. The fact that most of these islands are uninhabited make them the ideal destination for those who want to get away from the crowds. Croatia is rapidly improving its road infrastructure. Croatia is integrated into the European road marking system. European roads have the mark “E” and highway roads “M”. The most picturesque route in Croatia is considered to be the Adriatic highway (Jadranska magistrala) which connects Rijeka and Dubrovnik. When traveling from Dubrovnik, the departures of the regular shuttle buses from the main bus terminal are 90 minutes before the estimated takeoff time. Traveling by car is a great way to visit Dubrovnik, because it gives you the freedom to explore Dubrovnik Region as well. There are numerous places and towns to be seen and a variety of things to be done. If you plan to stay in a hotel, private accommodation or camp you might experience parking difficulties in Dubrovnik due to limited parking spaces available. If you are concerned about this issue, check with your accommodation provider, esspecialy if the accommodation unit is located in or around the Old Town of Dubrovnik. 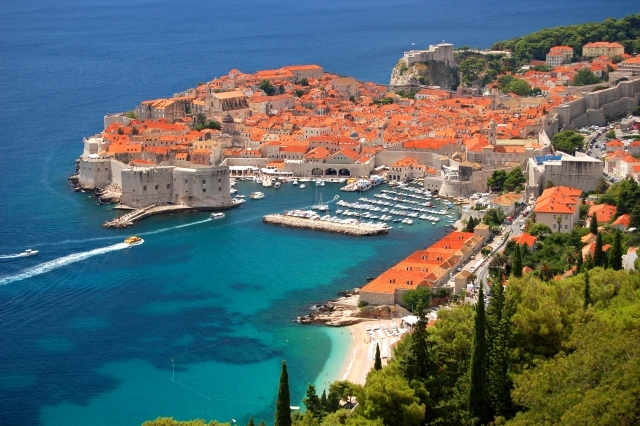 Exploring the Dubrovnik Region is a great way to enrich your travel experience. Regular public transportation will take you to most places worth seeing. Sometimes it is wise to buy tickets in advance, depending on where you wish to go. Ask your host, tourist information offices or at the main bus terminal in Gru for more information. Timetables for regular bus lines and to destinations most interesting to tourists are here. Gas stations are generally open from 7 am to 7 or 8 PM every day; in the summer season, working hours are extended until 10 PM. On-duty Gas Stations in bigger cities and on main international roads are open 24 hours. All pumps sell Eurosuper 95, Super 98, Normal and Eurodiesel. In Dubrovnik there are at least one or two gas stations who are open all night. For the directory with the addresses of gas stations in and around Dubrovnik click here.